India has potential to emerge as the global competency centre for cloud services, says Microsoft. India, with its powerful ecosystem of over 1300 independent software vendors (ISVs), 1.4 million developers and more than 11000 system integrators (SIs and custom software development organizations), is ideal to tap this growing opportunity. As a result, an additional 300,000 jobs related to cloud services are estimated to be created in India over the next 5 years. A study by global consultants, Zinnov estimates the global cloud computing market to be over $70 billion by 2015. Steve Ballmer, CEO, Microsoft Corporation said, "India will not only see a surge in consumption of cloud services, driving growth in domestic IT usage, but companies all over the world will look to India to support their transition to cloud computing." Microsoft's cloud infrastructure supports over one billion customers and 20 million businesses globally. Leaders from the industry and academia also support Microsoft cloud services. Rajendra Pawar, Chairman, NIIT said, "We foresee the power of the cloud and the following gap in the skill set. Through our exclusive program, our attempt is to offset this gap by churning out first-day first-hour trained professionals on Windows Azure". Academic institutions such as the IITs and IIITs are also building large India-relevant projects leveraging Microsoft's Azure platform. Cognizant has announced the creation of a vertically aligned set of industry frameworks and pre-built solution accelerators to enable implementation, migration and management of cloud-enabled application portfolios built on Azure for clients both in India and globally. "Windows Azure helps customers unlock the value that can be derived from cloud-enabled services, and helps them build strong and agile businesses," said Chandrasekaran, president and MD (global delivery), Cognizant. CDC Software has announced the global roll out of its flagship product 'CDC Respond' (a complaint and feedback management application for banking and government sectors) on Windows Azure. The Indian Institute of Science, Bangalore, is building a large-scale application on Windows Azure to study the basic resource allocation constructs and strategies required for addressing enterprise needs on cloud computing. These announcements are in addition to the over 4000 applications that have already been built on the Windows Azure platform by India. ISVs and SIs including Wipro, Infosys, TCS, HCL Technologies and Mahindra Satyam are building applications and solutions across verticals ranging from healthcare to banking to manufacturing for both local and global markets. 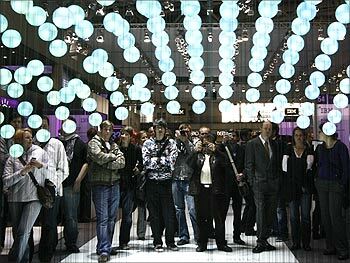 Image: Visitors watch a presentation about cloud computing at the IBM booth at the CeBIT computer fair in Hanover.